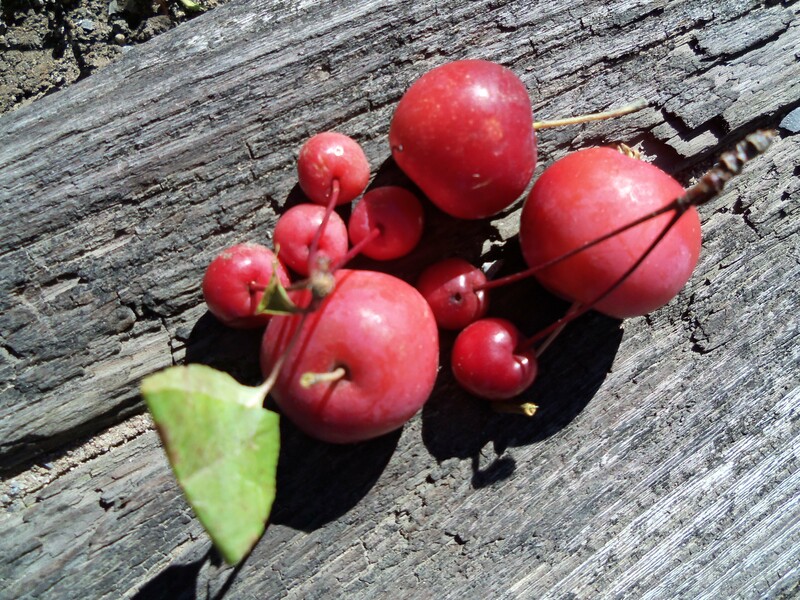 I found another variety of crab apples which were there for the taking when I was in Toronto last weekend. More like radishes in size, they are a little easier to work with for slicing. So, searching for another experiment, I have Valerie to thank for suggesting this one. It had occurred to me briefly, but I was intimidated by the thought of the mess it might make. Knowing someone out there was interested in the result, I was up for it. The result was far better than I expected, and the mess – not so bad after all. First, slice the fruit very fine. I used the slicing disc on my food processor. I put them in a bowl, and sprinkled sugar liberally on them to coat. Almost immediately, a sugary syrup formed at the bottom of the bowl. I tried two methods of drying: in the dehydrator overnight; in the oven for about six hours, depending how thickly they are placed, and just how much liquid sugar ends up in the mixture. Oven dried on the left, dehydrator dried on the right. The oven ones worked better, in that it was much easier to remove the sticky fruit from parchment paper than from the plastic trays of the dehydrator. For unsweetened dry fruit, I will use the dehydrator, but not with the sugary ones. Place the slices (and syrup) on a parchment lined cookie sheet. I started the process at 225 F to let some of the liquid evaporate, then after about 15 minutes, turned it down to 175 F and left it about 6 hours. This will vary depending on how well you can spread it all out. I did not let them get crisp at all – just dry enough to handle without any perceivable wetness, but still flexible (like a dried apricot or raisin). The ones in the dehydrator were a little dryer, in part because the syrup dripped down to the bottom tray. This accounts for the slight difference of colour. Valerie, you were right. So much better than apple chips. They make a great snack on their own, – good in baking. They would be an excellent substitute for dried apricots in something like a tagine dish, and of course with cereal or trail mix for those who like the sweetness. Categories: recipes, snacks, wild fruit | Tags: chips, crab apple, dehydrator, dry fruit, oven-dried, recipe, seasonal recipe, snack, tagine, trail mix, wild fruit | Permalink. 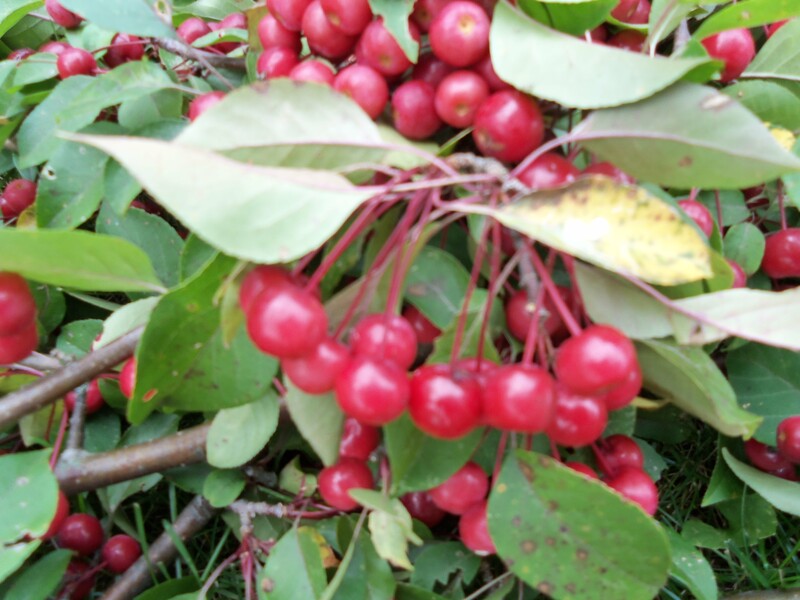 Crab apples are one of the easiest fruits to preserve with more pectin than most – it is even recommended as an addition to some jams and jellies to help them set. I thought I would try a preserve which, in South America, is often made with quince, guava or sweet potato, known as ‘dulce de’ whatever. So I will call this dulce de manzana silvestre. If not cooked quite long enough, you will get a rich, dark jam. Cook it a little longer, and it will set into a firm paste, which can be sliced or cut into squares – the former is served with fresh cheese and the latter eaten as a candy. But I find it has other uses too. I blended it in water and used it instead of orange juice in a pumpkin cake recipe, which added a subtle aroma. It could also be used like tamarind in savoury dishes. It would be excellent as a condiment, particularly for a Thanksgiving turkey dinner, or with pork or game. Again, I think I didn’t make enough of it to experiment as much as I’d like, but still hoping to find some more apples. I used the small ones from my tree in the garden, but any crab apples would work well. 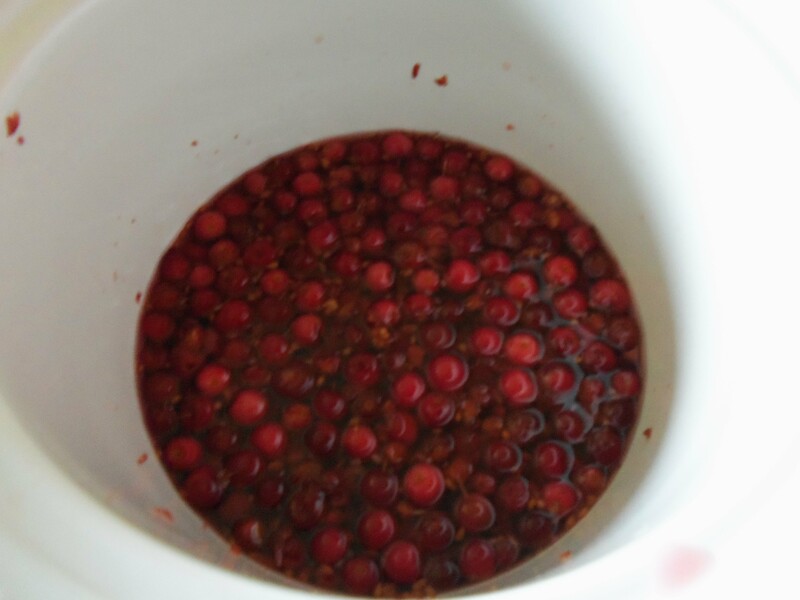 Cook the crab apples in water until they are very soft. This takes about an hour, but don’t rush them. The mushier, the better. 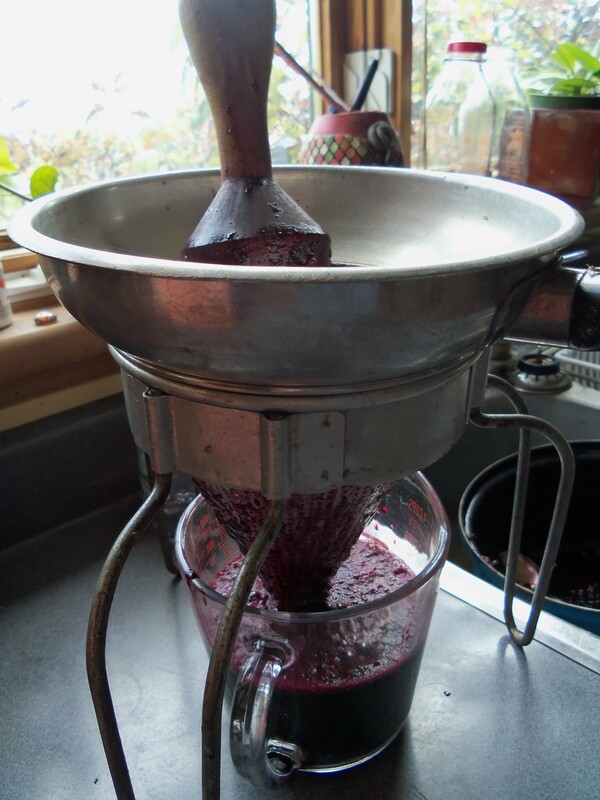 Strain the fruit, pressing out as much fruit as you can, much as you would making apple sauce. Return the juice to a pan, add the sugar and cook on a low heat until it looks dark and is about 1/3 the volume you started with. I put mine in a jar because I didn’t expect it to set as much as it did. Had I known, I would have used a square, non-metallic cake pan and cut it into squares. Categories: condiment, dessert, recipes, snacks, wild fruit | Tags: condiment, crab apple, dulce de manzana silvestre, foraging, local food, recipe, tamarind substitute, Thanksgiving recipe, wild fruit preserve | Permalink. September is a super-busy time for gardeners, in the kitchen and in the fields. Still no frost so there is some hope of salvaging the last of the harvest, collecting seeds, digging up bulbs before they all succumb to the cold weather. And then what to do with the fruits of your labour? 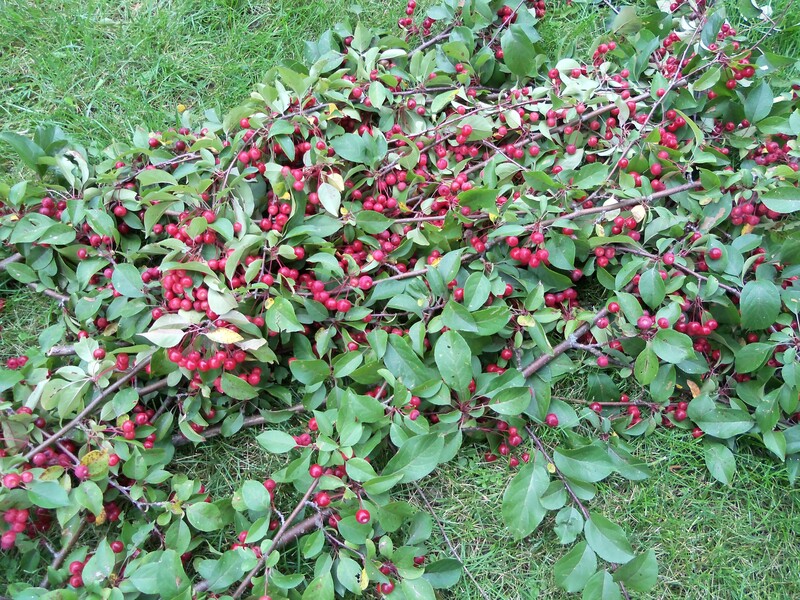 I just added another task/load of experiments when I finally pruned our lone crab apple tree. It doesn’t usually produce as much as it did this year, so I felt I could afford to pick some of the fruit, and still leave plenty for the bohemian wax wings who visit the tree most winters. Crab apples are not frequently found in farmers’ markets, let alone supermarkets, but nonetheless there are plenty of good recipes on line which are worth making for jellies, chutneys, pickles and baking. I began by working out a couple of recipes that don’t seem to exist yet, and the possibilities with this bright little fruit seem pretty endless. Not wanting to deplete my tree any further, I am offering to prune anyone’s tree in this area and share the produce! My tree (the same one you see in bloom on the header of this blog) gives those small, bright red, supposedly inedible variety. They look more like cranberries than apples. Having snipped all the berries off the pruned branches (that is the hardest part), I chopped them roughly in the food processor. I dried the majority of them to make a salad dressing and muffins, and still plenty to put away for winter. With the rest I prepared, or rather am preparing, a liqueur which will be perfect as a festive drink. No pictures of the finished product yet, but the concoction should be ready to decant in mid-October. I will also think of some way to use the vodka soaked fruit at that time. Weigh the crab apples (I had about 1.25 lbs.) Add the same weight of sugar to the pot, cover the mixture with vodka, and stir. Stir every day for about a month, then strain into a bottle. Keep the container covered so the vodka doesn’t all evaporate or get infested with fruit/alcohol flies. I used a ceramic pot with a tight fitting lid. Mine has been going for about a week now. Having sampled the small amount stuck to the spoon after stirring, I can vouch that it is delicious – and we look forward to using it in mixed cocktails and on its own. We shall see! 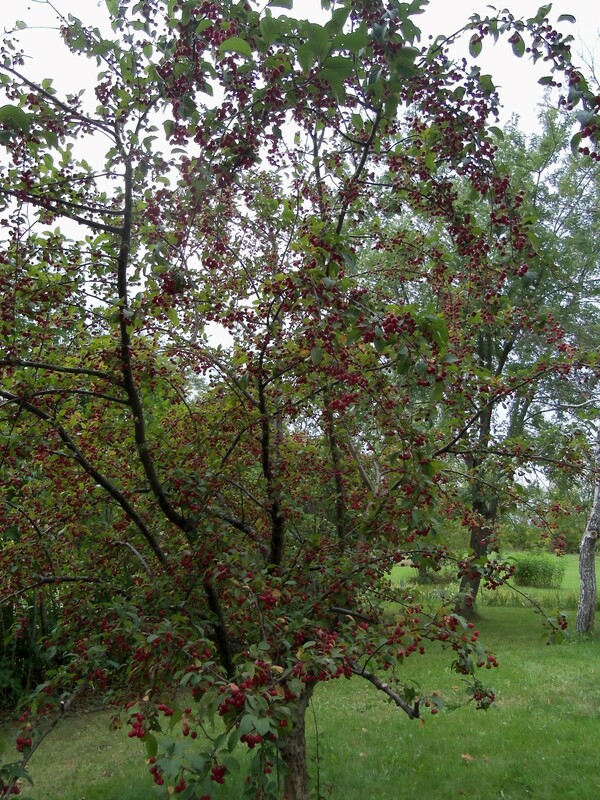 And if you don’t have crab apples, this could be done with many varieties of fruits and berries. It is difficult to give exact quantities in this, but then salad dressings should be tweaked to suit your own taste. If you usually make your own vinaigrette, you would probably find you need a little more salt and vinegar than usual, presumably because of the tartness of the fruit, but add a little at a time and taste to be sure. Vinegar (cider or red wine) to cover, plus a little extra. This is excellent with any leafy salad. 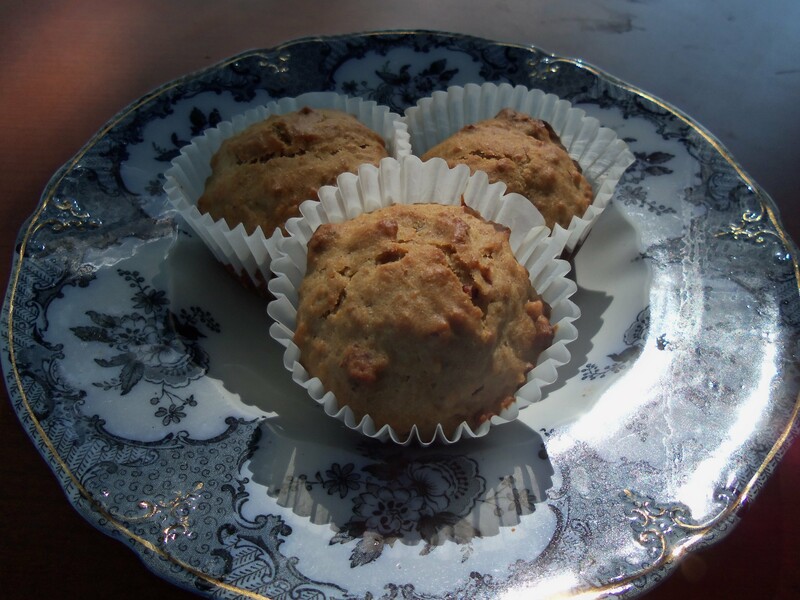 I expect most readers already have their own favourite recipes for muffins – in which case I would recommend just adding the dried crab apples in place of or in addition to any fresh or dried fruit. Likewise, the dried crab apple can be used in many other recipes, such as cookies, granola bars, or even savoury rice or stuffing dishes. I added some to porridge, along with a little cinnamon. If you don’t have a recipe handy, here is the one I used. Combine the dry ingredients. Mix together the rest, and add to the dry ingredients, mixing just to blend. Pour into muffin tins, and bake at 350 for about 25 minutes. 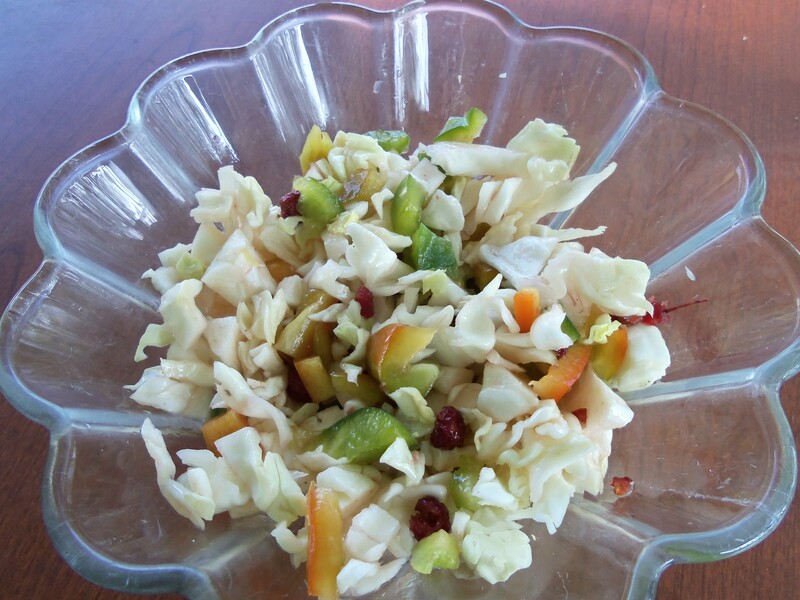 Categories: recipes, wild fruit | Tags: crab apples, dried fruit, foraging, liqueur, muffins, recipes, salad dressing, storing, vinaigrette, vodka, wild fruit | Permalink. This recipe was inspired by one of David Lebowitz’s blogs where he described eating a pizza at a friend’s house which was made simply of fried vegetables on top of a layer of Dijon mustard spread on the dough before baking. I decided to try it using creeping Charlie, something I had never tried cooking with before. The result was very good, and will make that one again, perhaps using mushrooms, eggplant or some other vegetable I have in my garden. I might even consider using other mustards, but the mustard is a must. Its sharpness is a great substitute for cheese! 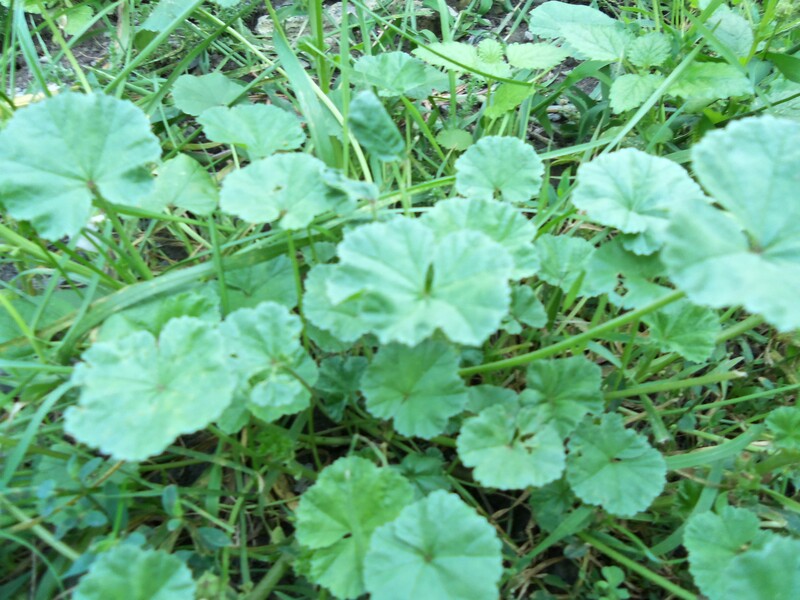 It is another of those weeds which enjoys popularity as a medicinal herb in many countries, and is most often taken as a tea. As with any new food, one should always approach it with caution, just in case of allergies or whatever. So the pizza is garnished with a few of the younger leaves to test flavour etc. I also tried a couple raw just to make sure. These pictures should help you identify it. If you have a super healthy lawn, you might have trouble finding it there, but otherwise it is everywhere. If you are in doubt, check with someone who knows, or search more pictures on the many sites covering this subject, such as the one here. Begin with any pizza dough of your choice. I used a whole wheat one for this recipe. Fry some onions until soft, add zucchini, garlic, herbs, salt and pepper to taste and continue to fry until all the vegetables are soft. Toss the creeping Charlie leaves in enough olive oil to coat. Spread the dough with a layer of Dijon mustard. Arrange the vegetables on top, and cover with a layer of creeping Charlie leaves. Bake in the oven as you would for any other pizza (350 until it looks done). Categories: edible weeds, recipes | Tags: creeping charlie, edible weeds, gardener's pizza, recipes, vegan recipe, vegetarian pizza | Permalink. This is turning out to be a great year for grapes, at least in Eastern Ontario. I have managed to cut down on the labour of picking them by putting stems and all into the food mill. If you don’t have a food mill, it is a great investment for around $20. You often see them in flea markets, and they do exist in some kitchen stores too. I use it for apple sauce, ketchup, grapes, tomato sauce, etc. and especially at this time of year, it is indispensable. 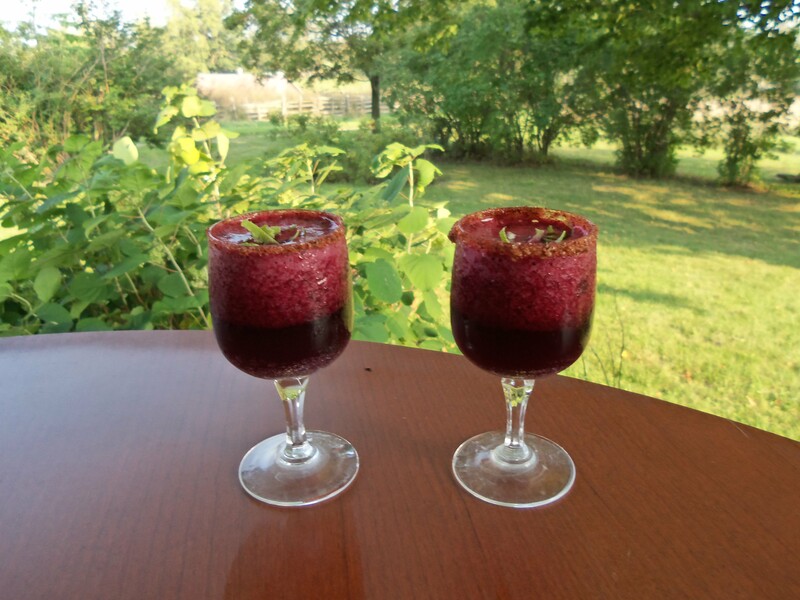 In an effort to come up with more ways to enjoy this bounty of grapes, I made a margarita-like drink with some of the granita from yesterday’s post, and named the drink marganita. Definitely a success, and with this hot weather continuing at least for to-day, will have another when my day’s work is done. Here is the recipe. Pour into glasses which have been wetted and dipped in a mixture of chili pepper and salt. Garnish with lime zest. 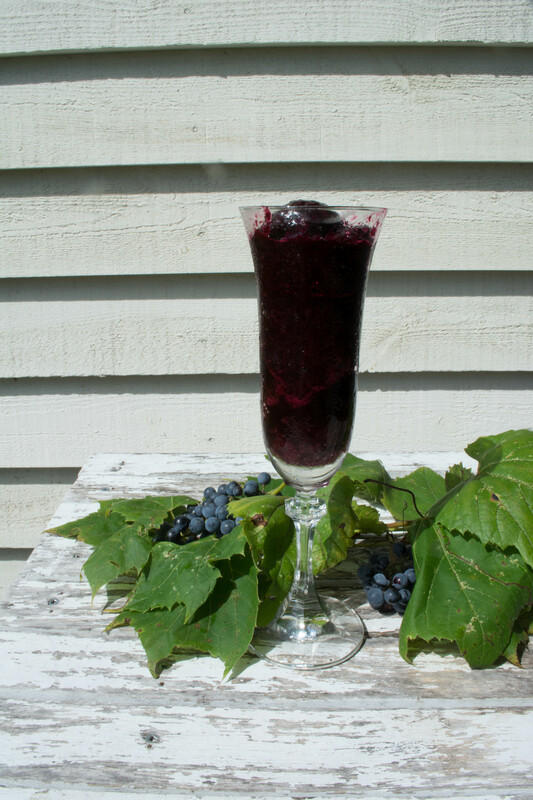 Categories: recipes, wild fruit | Tags: alcohol, aperitif, cocktail, drinks, granita, ice drink recipe, margarita, recipe, tequila, wild grapes | Permalink. Granita is the simplest frozen dish ever – just a mixture of fruit, sugar and water. It makes a refreshing snack on a hot day like today, can be used as a dessert, or served alongside cheese. I like to think of it as a gourmet popsicle. There are plenty of recipes out there for granitas of all kinds of fruit, but the only ones for grapes I found were for cultivated grapes. The wild grapes have so much more flavour and colour, not to mention nutrition. Also, I have just too many grapes and felt it was time I experimented some more. 2. Remove the berries and put in a saucepan. Cover with water, bring to a boil, and simmer for about five minutes. Strain, discard seeds and skins, and return to the saucepan. 3. For 3 cups of juice, add 3 cups of sugar syrup and the juice of 1 lemon. Mix together and pour into a container with a lid to be frozen. Once it starts to freeze, break up the ice with a fork. Repeat this about every 45 minutes until the mixture is frozen right through. Tip: Use a shallow container with a tight fitting lid. It will freeze much more quickly. Also, when adding the sugar, don’t add it all at once so you can test for sweetness. If you pick your grapes after the first frost, they will be sweeter than the ones I am using, so might require less sugar. Categories: dessert | Tags: dessert, foraging, frozen dessert, granita, recipe, wild grapes | Permalink. This is a quick and easy recipe using the wild grape ketchup from my last post. You could do it equally well with other berry preserves or chutneys, but I find the flavour and colour of the grape goes particularly well with the beets, which are now ready to be picked from the garden. You can vary the ingredients and quantities as you like, but for those who like clearly written recipes, this is what I did. Cut the beets and onions into wedges or rings. Fry them together on a medium heat in the oil until the onions are soft, but not brown, about 10 minutes. Add just enough water (about 1 cup, depending on the surface are of the pan you are using) so that they will not dry out completely. Cover and simmer until the vegetables are tender, stirring occasionally and checking that there is enough liquid. Add the ketchup, honey and seasoning and simmer another couple of minutes. This recipe can be made ahead and reheated in the oven. The extra cooking improves the glaze. Categories: garden vegetable, recipes, wild fruit | Tags: beets, fruit glaze, locavore, onions, recipe, side dish, vegetarian, wild grape ketchup | Permalink.